21:30, Sunday night. The phone is ringing. That’s odd. Who would phone us at this time of the day. (In France, you don’t usually phone people after 9). I’ll answer anyway. Person on the Phone : Mr Durand ? Person on the Phone: This is Chambéry central police station. Do you own a Renault trafic ? Police officer : Someone contacted us to let us know that your car is opened. Me: Ok, Thanks, I’ll go and check. A local councilor had spotted that the back door of our van was opened and contacted the police to find the owner. He closed the door and waited for a while to see if I would turn up. He was still there when I arrived. Silly me had left the back door opened after coming back from a walk with the boys. No one had visited the car as far as I can tell. At least, I got to talk with one of the local councillors. It is here. We went to pick it up on Monday afternoon. It is big. It is powerful. It will take a bit of time to get used to it. It is our new vehicle: a second-hand Renault Trafic. It is a 9 seater so there is plenty of space. Esther’s mum and dad are with us until Sunday so we’ve been on several test rides. The timing is perfect. Esther had problems with the old, faithful Multipla. Our plan is to get it destroyed anyway so it will go earlier than we thought. Just as well. We spent the weekend in the family chalet. 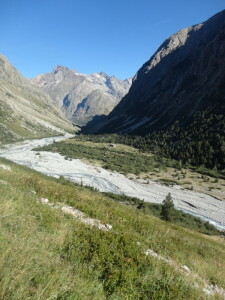 It is located in a remote valley at the heart of the Massif des Ecrins. 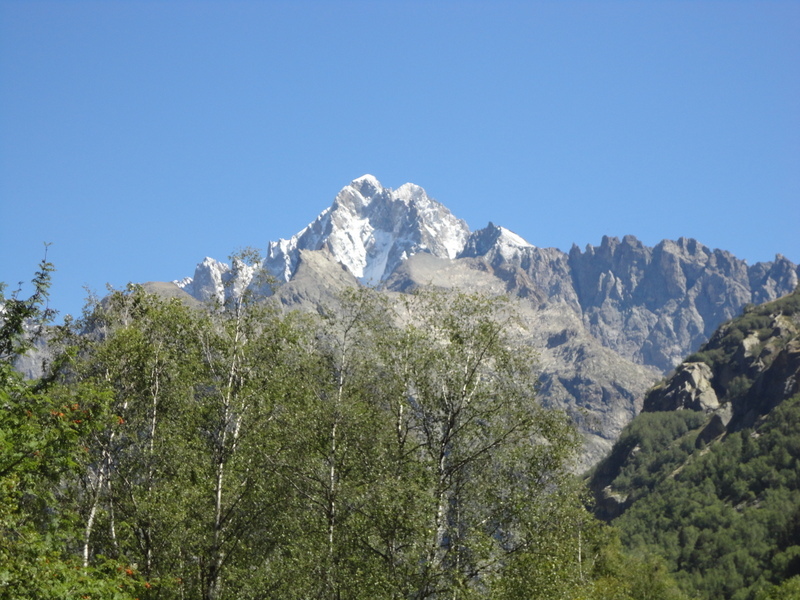 It is a beautiful, wild setting, facing the Ecrins and it is a good place to rest and meditate. There is no electricity, but running water and gas to heat the water and cook. The weather forecast was good. We had planned a walk on Saturday and drove up on Friday afternoon, after school. But early in the night, one of the boys hurt himself. He fell in the dark and hurt his left arm. I sent him back to bed but he was still hurting after several hours and couldn’t sleep. His elbow was swollen so I thought I needed to take him to the nearest hospital. Except the nearest hospital was in Grenoble, over 80 km away, the first 30 km of the journey being on a narrow, dark mountain road, with impressive drops at places. But there was no choice. It was about 3 am. We drove down and saw plenty of wild life: deers, foxes and badgers. 2 of each. We got to the hospital at 4:30 am and checked in the Emergency Unit. It seemed quiet. the staff was quick and efficient. We were able to leave at 7. We were back in the chalet at 8:30 am. Not bad. We spent more time on the road than in the hospital. Maxime now has a plaster on his left arm. We are not sure what the problem is. The doctor couldn’t see any broken bones on the x-rays. But we will check in a week time in the hospital in Chambéry. He is fine. Thanks to those who showed concern. The rest of the weekend was uneventful. We weren’t able to walk much on Saturday but we made the most of the mountains. On Sunday I went for a quick walk with Jean-Baptiste before packing up and driving back. It was sunny and there wasn’t a cloud in sight. 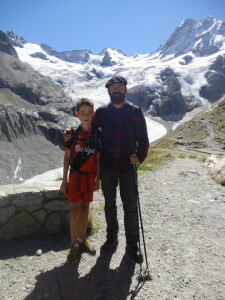 This week, Jean-Baptiste and I went back to the family chalet to do some walking. 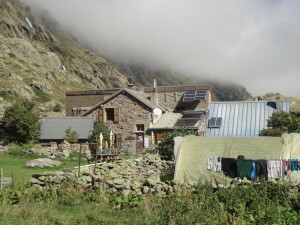 Our main goal was a mountain hut over 3:30 hours walk from the car park in la Bérarde. We didn’t have time to go up there in July. We decided we’d do another walk on the way up and sleep in the chalet before walking up to the “refuge de la Pilatte” on the next day. One of my aunts was staying in the chalet with her grandchildren and had accepted to give us hospitality for the night. Otherwise, we would have slept outside in the field, not a problem. The weather was hot and sunny. It had rained a lot the previous two days so we set up in the fog. But it soon lifted and the sun came out. There weren’t any clouds in sight. 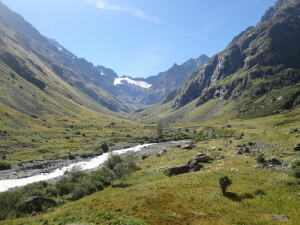 First day was a fairly easy 2 hours walk in a beautiful valley. we were early and crossed about 40 people going up when we were walking down. The second day was much more challenging. 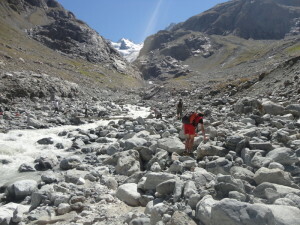 It is a long walk, almost flat three-quarters of the way and a very steep climb at the end. It took us 3:45 hours to go up, mainly because we had to walk on the left side of the valley because a bridge was missing at the bottom of the steep climb. that way is longer than the normal route. 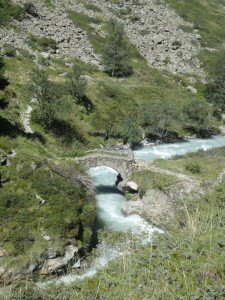 On the way back, we were able to cross the river as the bridge was being repaired. Jean-Baptiste walked well but struggled a bit at the end on the way up. It was getting warm and he was hungry. At the top, we relaxed and chatted with two Scotsmen who had just come down from the mountain. I recognized one of the men’s Glasgow accent. 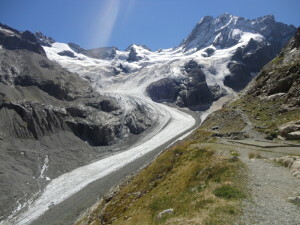 I was struck by the changes on the glacier. It had melted so much since my last visit 11 years ago. I’ve read that it has lost 50 meters in height since 1990 and much more in length. It is making it much more challenging and dangerous to climb the mountains around. The two Scottish mountaineers had to renounce their climb because it had taken them too much time to find a path through the glacier and its many crevasses. When they got to the bottom of the mountain, it was too late to climb. We walked down in 2:30 hours, relaxed in the chalet for a while before driving back home late in the afternoon. We went for a holiday straight after the Family Conference. My family owns a chalet in the Southern alps at the heart fo the Massif des Ecrins, in the Vénéon Valley. It is an amazing spot, in a wild valley. There are plenty of tourists, but it is hard to get there and if you are not into mountain sports, there is nothing for you to do. The chalet is a few miles from la Bérarde. There is running water and gas, but no electricity. There is plenty of space around and many walks to do. The children had fun. We went on a few walks. Some of them as a family, the others just me and the older boys. for the last walk, I went with Jean-Baptiste. It was a long, steep climb, but well worth the effort. We had good and warm weather apart from one gray day and one rainy day. It was great to be back. Our last family holiday there was 4 years ago, before Benjamin was born. I’ll post pictures later in the week. It was good to have a break but it is also good to be back.